A New Yorker magazine cover has inspired women surgeons all over the world to post pictures of themselves on social media mirroring the illustration. French artist Malika Favre created the April 3, 2017 cover illustration for the New Yorker from the perspective of a patient, with a circle of four female surgeons donned in surgical masks peering down from above. A backdrop of round surgery lamps shines behind their alert faces. Now images are popping up all over Twitter, Facebook and Instagram of women surgeons in the same pose. Many are hash tagging their photos with #ilooklikeasurgeon, which trended on Twitter in 2015 when women surgeons took selfies at work and posted them -- a movement of solidarity with their fellow female colleagues and to help quell stereotypes about the profession. “Seeing women recreating my @newyorkermag is just an amazing feeling! !” Favre said on her Facebook page. 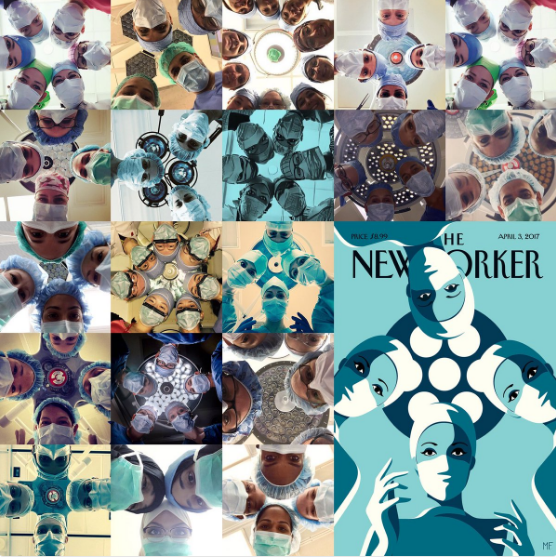 In this latest social media trend, one photo from Washington University in St. Louis, Missouri, shows 16 female surgeons nestled together in a recreation of the New Yorker cover pose. “It’s such a powerful symbol of women’s empowerment,” Jessica Shepherd, assistant professor of Clinical Obstetrics and Gynecology and director of Minimally Invasive Gynecology at the University of Illinois Chicago, told CBS Chicago. “The cover is a symbol of what we aspire to, and what our daughters can be,” she said. The New Yorker ran a column this week about the popularity of their cover, saying that after the magazine was released, the cover took on a life of its own when Susan Pitt, an endocrine surgeon at the University of Wisconsin, issued a challenge to her fellow female surgeons to replicate the image in real life. Pitt encouraged surgeons to use the hash tag ‪#NYerORCoverChallenge‪, too. “Hundreds of surgeons across the world responded to the challenge, taking photographs and sharing them online,” the New Yorker article said. According to the Association of American Medical Colleges Physician Specialty Handbook, in 2010, only 15 percent of physicians practicing general surgery were women. “For me and women surgeons who are a little bit older, it’s a thank you for the recognition,” breast cancer surgeon Dr. Deanna Attai, told CBS News. An assistant clinical professor in the Department of Surgery at the UCLA David Geffen School of Medicine, Attai said that the New Yorker cover moves forward the acceptance of women in medicine, especially the field of surgery which has a history of gender discrimination. “Younger surgeons and even patients now accept that women can be physicians and surgeons, but the reality is that there is still a significant amount of discrimination. There is still a significant amount of gender bias both on the parts of other medical colleagues and patients, whether it is conscious or not. Surveys on pay gaps show this,” said Attai. Attai said there’s still a lot of change needed, though. Separate from her work at UCLA -- a diverse professional environment -- Attai said she’s affiliated with a 500-bed community hospital in Burbank, California. “I practice in a community hospital and I wouldn’t be able to recreate that picture because there are only three female surgeons there. When I saw this [New Yorker cover], that was one of the first things that I thought,” Attai said. Orthopedic surgeon Dr. Vonda Wright posted an image on her Instagram page shortly after the New Yorker cover came out. “The photo really resonated with me and I have to admit I watched the video version several times with the eyes blinking over the surgical field. I think it’s because I never see myself in the OR or nearly anywhere in my world, where 97 percent of people are men,” Wright, assistant professor of orthopedic surgery at the University of Pittsburgh School of Medicine and medical director at the UPMC Lemieux Sports Complex in Cranberry, told CBS News.